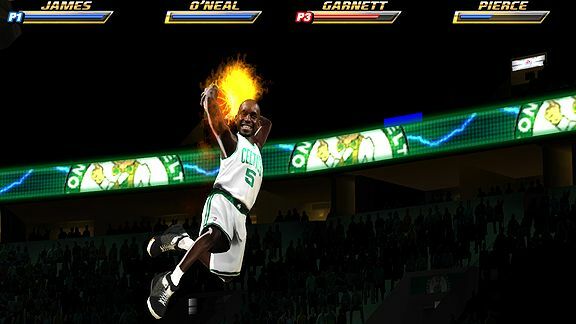 EA SPORTS Trust us on this one: There will be no fretting about the state of Kevin Garnett's knees when KG's likeness appears in the new home version of the groundbreaking arcade game NBA Jam. One word is synonymous with the most addictive two-on-two basketball in the history of the sport. It's a word that instantly transports you back to 1993, when NBA Jam was introduced as the first arcade game officially licensed by the league and soon became the most lucrative coin-operated machine ever seen. It's a game so revered for its exaggerated dunks, long-distance swishes and unforgettable catchphrases ("He's on fire!") 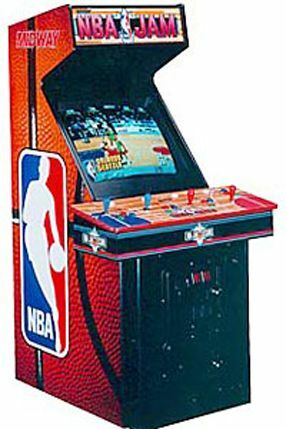 that literally dozens of current NBA players can't wait for December, when EA Sports unveils its updated version of NBA Jam for the Nintendo Wii. I've always been a serious sort -- even as a little kid who traded in toys for Strat-O-Matic board games at a frighteningly early age -- but NBA Jam turned me into an irresponsible teen when it arrived. A 24-year-old with a full-time job shouldn't have been spending as many hours and quarters as I poured into my favorite machine at a 7-Eleven in West Los Angeles. I just couldn't stop. Not then and not now. When I heard EA was not only resurrecting the greatest video game of all time but inviting NBA fans and gamers to vote for the players they want to see in the new NBA Jam, I knew I wouldn't be able to resist writing about it. Voting on three teams per week began in mid-January and ends Monday, with EA listing six players for each team and allowing respondents to pick only three. The following breakdown lists the original two-man pairings in the arcade version, EA's six nominees for all 30 teams and the three-man rosters I want to see. It's a lighter topic than those typically tackled here, true, but think of it this way if video games aren't (and/or weren't) your thing: It's also an exercise to get you thinking about your three favorite players from every team. Tempting as it is to go the respect route with KG, Pierce and Allen -- since this is a game that can make them all look young and spry again with all the super-hero athleticism -- how could you possibly exclude Rondo? Especially in a game with no free throw shooting required? (I do suspect some gamers will rue the fact that Nate Robinson, by virtue of the fact that he's only been a Celtic for a month, wasn't on the ballot. although we're naturally banking on some sort of cheat code you can win/find on an online cheat site to unlock new owner Michael Jordan as a Charlotte player. Quite a slight to Brad Miller that he didn't snag the last spot on the Bulls' ballot, which would have been our reaction even if the Bulls hadn't traded Salmons to Milwaukee. With or without Miller, though, you start with Rose and Noah and are inevitably drawn to Deng over Hinrich. This, after all, is an injury-free virtual world. LeBron? No explanation necessary. Shaq? Too legendary to even think about snubbing, especially after he famously made Orlando cart around the original arcade version on road trips so he could get his NBA Jam fix. The final vacancy? Williams and Jamison obviously have to be considered strongly, but who doesn't think about Varejao when they think about the Cavs? Varejao might be Cleveland's second most influential player, has great chemistry with LeBron and has scrapped his way straight into the Sixth Man Award race with Atlanta's Crawford. Reassuring as it to know that my beloved Nowitzki will finally be getting some hops, this has to be one of the toughest groups to slice to three. You can start with future Hall of Famers Dirk and Kidd, try to exclude Butler and Haywood on the grounds that they don't have enough Dallas seniority and you still end up having to choose between Marion and Terry. The Matrix is fortunate he has the versatility (and the nickname) to break the deadlock. Once you get past the reflex selections of Melo and Chauncey, both Smith and Andersen have undeniable appeal because (A) they're the two most combustible Nuggets, and (B) combustion usually rules in the NBA Jam universe. But I must be getting sentimental in my old age, because I'm going for K-Mart. The NBA's first and only comeback from microfracture surgery on both knees always gets me. Gordon, Villanueva and Stuckey can all make a stronger case than Prince these days, but don't you prefer to remember the Pistons as they were for most of the past decade? Us, too. Size and strength were required commodities for success in the original NBA Jam because of all the dunks, blocks and heavy contact, but the Warriors have precious little of those commodities in real life. So I've defaulted to the three most entertaining Warriors, capped by my favorite: Morrow. Monta and Curry are the bigger names, obviously, but I could watch Morrow shoot all day. Battier is Mr. Rocket, but I think even he'd concede that NBA Jam isn't really his scene. You could obviously say the same about 7-foot-6 man in the middle, but seeing what a supersized Yao looks and plays like flanked by Brooks and Martin (or Ariza) is an opportunity that can't be squandered. Question that has to be asked: How could Troy Murphy and especially Pacers lifer Jeff Foster not be made available to the voting public? Murphy surely would have been my pick alongside Granger and Hibbert, but instead it comes down to an unenviable choice between Jones' defense and toughness and Ford's speed. Another very curious ballot, because Camby went to Portland in the trade that brought Blake to the Clippers but somehow remained on L.A.'s list. The important thing, though, is that Griffin's Jam incarnation will be 100 percent injury-proof. My other votes go to Kaman and Davis as Griffin's sidekicks, although I'm sure there's a segment of the Clipperland population that would choose Gordon over Baron and his beard. Artest has been a (mostly) quiet and successful fit for the Lakers so far, but there just isn't room for him on L.A.'s three-man Jam squad. I'm fairly sure all of us would start with Kobe and most of us would choose Pau over Bynum. And I personally could never snub a lefty I like as much as Odom, no matter how handy Artest's rugged presence would be with the way bodies fly around in this game. If you've enjoyed watching the Grizz maintain a season-long challenge to Oklahoma City (and now Milwaukee) for Biggest Surprise Team status, wait until you'll see the damage these three do in the virtual arena. I know the jokes are coming about D-Wade having to do all the work even in a video game. I also know that I should probably be finding a spot for Beasley in my Heat top three, but I can't. Not even the lefty factor can slide Beasley in ahead of O'Neal (still a defensive disruptor) or Haslem (whose effectiveness in the 2006 NBA Finals is etched in the memory) on this scorecard. Two lefties with irresistibly quick releases flanking our soccer-loving pal Bogut? This would be one of my go-to teams for sure. and our pining for Ricky Rubio only gets louder when we imagine his turbocharged Jam likeness. The duo of Coleman and Drazen was one of my three faves when I got hopelessly hooked on the arcade version at that 7-Eleven, right up there with Golden State's Hardaway and Mullin and Phoenix's Charles Barkley and Dan Majerle. Have to confess that I didn't get the same charge combing through my options with the 7-61 Nets. The Hornets traded Brown to Chicago on Jan. 25. Why Brown and Marcus Thornton appear as Hornets options -- but Darren Collison and Emeka Okafor don't -- is probably the biggest mystery in EA's interactive balloting. But this much is clear: Collison's omission makes it slightly easier to settle on a trio here. Paul and West are slam dunks, with our pal Peja and his 3-point rainbows that were made for this game holding off the fast-emerging Thornton. The results of fan voting are scheduled to be revealed online between mid-April and June, but one source with knowledge of EA's thinking said this week that the game's design team reserves the right to make roster alterations based on "significant team additions or changes" in free agency this summer. Knicks fans will obviously be hoping this disclaimer applies to their team more than any other, but for now sentiment has kicked in again and swayed me to wedge McGrady in alongside Gallinari and Lee. I'm already bracing for the e-mails of protest for linking the Sonics with the Thunder, but hopefully this link to an old NBA Jam story on ESPN.com -- complete with tales of Gary Payton's dismay because he somehow lost out to Benjamin when the original Sonics tandem was chosen -- will lighten the mood. Protests from Oklahoma City for omitting Harden are also expected, but I don't see how you give you him Green's slot. With the way Lewis has been slumping, by contrast, I don't foresee much resistance if any to our preference for Jameer over Rashard to complete Orlando's trio with Dwight and Vince. Agreed? Couldn't help it with the Knicks and I'm guilty again with the Sixers: I want to see vintage Iverson in this digital playground just like I want to see McGrady. Philly's kids will have to wait. It seems safe to suggest that the two-man game Nash and Amare have perfected over the past six seasons will be spectacular in the two-on-two world of Jam. J-Rich's decorated history as a dunker will undoubtedly snag him the third spot in fan voting, but my Hill history (covering him and talking soccer with him) wouldn't allow that. Nicolas Batum? Jerryd Bayless? Neither of them, sadly, was an option in fan voting. The good news? Nothing worse than getting dunked on or rejected at the rim can happen to the Jam version of Oden, so let's hope he does better than Gary Payton did in 1993 and makes the programmers' cut to represent the Pacific Northwest. although temptation might have been greater had DeJuan Blair been an option. Although DeRozan's speed and athleticism would clearly mesh best with Bosh and Bargnani, I'm too intrigued by the novelty of a Bosh-Bargnani-Hedo triumvirate. It is a game, after all. Williams and Boozer aren't quite as automatic as a tandem as Malone and Stockton were in '93, but Boozer has defied all the skeptics and remained one of the focal points for a team unexpectedly holding one of the West's top four seeds. Kirilenko's renaissance, meanwhile, has been a timely reminder that he's an NBA Jam natural with all that versatility. Bill Clinton is one of the more famous hidden characters to unlock with a cheat code from NBA Jam's early days. We're pestering our sources in the gaming community to find out if President Obama -- or Washington neighbor Gilbert Arenas -- can expect the same treatment in the 2010 edition. "I want the public to understand that I am with this team, [through] thick and thin, be it in that [courtside] seat or not in that seat. My No. 1 priority is the Charlotte Bobcats, without a doubt, and you guys should know that I wouldn't make this commitment if I didn't have that type of commitment." Hall of Famer Michael Jordan, speaking at his first news conference Thursday since being confirmed by the league this week as the Charlotte Bobcats' new majority owner. Indirectly addressing the frequent criticism about his visibility in Charlotte during four seasons as the Bobcats' team president, Jordan insisted that he wouldn't have made the financial investment necessary to purchase the team from founding owner Bob Johnson if he wasn't planning to be a hands-on boss. Not that Jordan -- who says he'll be in Charlotte "as much as possible" and that he hopes to stay with the franchise long enough to get his children involved -- will be insisting on formal titles when he's addressed by Bobcats players. "They can call me MJ," Jordan said. "They don't have to call me 'Boss.'" It is widely assumed that LeBron James and Chris Bosh are the two marquee free agents Dwyane Wade wants the Heat to pursue starting July 1. The reality, though, is that Amare Stoudemire should be regarded as no less than an equal in this conversation. Given all the options and potential outcomes of LeBron's foray into free agency -- and Bosh's recent insistence during All-Star Weekend that he's in no rush to relocate just to be regarded as someone else's sidekick -- Stoudemire would appear to be the most signable of the three. One source close to the situation insisted this week that Wade and Stoudemire are closer than advertised as pals even though they haven't played together on Team USA since 2004. The source also said that Miami is indeed Stoudemire's first choice in free agency if he finally leaves the Suns this summer after being shopped by Phoenix at two successive trade deadlines. 4: Chris Bosh's name is rarely nominated when the subject of clutch players is broached, but the numbers suggest he's being overlooked. Bosh's game-winning bucket Wednesday against Atlanta with 2.1 seconds remaining pushed him to 4-for-4 shooting this season in the final 24 seconds of one-possession games. 15: When LeBron James paced the Cavaliers in points (32), rebounds (nine) and assists (nine) in Wednesday's win over Indiana, it marked the league-leading 15th time this season he's led his team in all three categories. New York's David Lee is No. 2, having done it six times. 28: With 29 points, 12 boards and 12 assists in a Tuesday night win over Detroit, LeBron inched closer to second place among active players with 28 career triple-doubles. He trails only Dallas' Jason Kidd (104) and Phoenix's Grant Hill (29), with the Los Angeles Lakers' Kobe Bryant and Boston's Kevin Garnett tied for fourth at 16. James has four triple-doubles this season; no one else in the league has more than one. 23: The Detroit game was LeBron's 23rd career outing with at least 25 points, 10 rebounds and 10 assists. That's third all-time since the NBA-ABA merger in 1976-77, behind only Magic Johnson (40) and Larry Bird (29), and one spot ahead of Michael Jordan (22). 2,001: The Pistons went 2,001 games without a 20-assist game from one of their players until Will Bynum's 20 dimes this past Friday at home against Washington. The last Piston to reach that plateau was Isiah Thomas on April 12, 1985, at Joe Louis Arena, also against Washington. Replacing the ailing Rodney Stuckey in Detroit's lineup, Bynum became just the third player in the league to record at least 20 assists in a game this season, joining Phoenix's Steve Nash (who has done it twice) and New Orleans rookie Darren Collison. More interesting Summer of 2010 chatter in the East can be found in this video piece from our own Ric Bucher, who reported this week that signing Joe Johnson away from the Hawks would not only reunite Johnson and former Suns coach Mike D'Antoni but also help the Knicks' chances of luring James, who's said to be an admirer of JJ. Q: Has it been any consolation during all this losing when you hear people say that the Nets have a good future because they've got nice pieces like Lopez and Devin Harris? A: It's nice, but that's the future. It's exactly what you said it is. I'm too focused on the present. I can't jump ahead or anything. Q: How much are you guys talking about the record [Philadelphia's 9-73 record in 1972-93] among yourselves? A: People keep asking: "Are you just trying to get to 10 wins? Is that your focus?" It'll be nice [to get there], obviously. Hopefully that'll be soon, and hopefully there'll be a few more after that. We're trying to win as many as possible. We're not trying to just get to 10 and stop. Q: What is all the attention you're getting from defenses doing for your game? What do you do better now than you did as a rookie? A: I've learned a lot about the double-team this season, how to deal with it, reading when it comes, whether I'm going to attack right away or hold the ball. But I'm very far away from where I want to be. Q: From afar I'd guess this feels like the Season That Won't End. What kind of mental toll has all this taken? A: It's tough. Personally I've played a couple games [lately] that haven't been up to my standards. That's been bothering me. But as a team we're still playing hard, we're still in games, so I can't complain about that. Q: So you really don't have the urge to go upstairs once in a while to ask the bosses what the plan for the future is? you've got to focus on what you can do and what I can control. There are two theories in circulation to explain Luis Scola's recent career-best run of five consecutive 20-and-10 games in Houston. 1) The attention newcomer Kevin Martin is drawing from opposing defenses with his movement off the ball -- imagining how he'll mesh next to Yao Ming next season with his ability to put teams in the penalty by drawing fouls is what got the Rockets so interested -- is loosening things up for Scola. 2) Scola has been playing like a man unburdened since the passing of the Feb. 18 trade deadline. One source close to the Argentinean says that the unsettling prospect of being dealt, no matter how much his Houston bosses assured him that he wouldn't be moved, had seeped into Scola's psyche. Since the deadline? Scola finds himself with a bigger role because the Rockets had to surrender Carl Landry to Sacramento in the Martin deal and has responded with nine double-doubles in 13 games. In March alone, Scola is averaging 23.1 points and 12.8 rebounds. Which makes him an interesting name for your list of 2010 free agents no one's talking about, even if the 29-year-old is only a restricted free agent, meaning that Houston will have the right to match any offer sheet Scola receives. 750: Steve Nash, with his 750 assists for the 2009-10 Suns, has established a new single-season assist record for players at least 35 years old, topping the 713 assists recorded by Utah's John Stockton in 2000-01. 21: Utah's Deron Williams has registered at least nine assists in 21 consecutive games for the longest such streak within a single season since ESPN's Mark Jackson did so in 29 consecutive games for Denver in 1996-97. Yet you can be sure that the postscript won't be duplicated this time: Jackson was dealt from the Nuggets to Indiana two weeks after his streak ended. 6: Memphis' Zach Randolph is up to six games this season with at least 30 points and 15 boards, just ahead of Toronto's Chris Bosh (five) and Orlando's Dwight Howard (four). 5: All five Lakers starters scored at least 15 points in this past Friday's win at Phoenix, which hadn't happened for L.A. since Dec. 7, 2003. The Lakers' starters in that win over Utah nearly seven years ago: Shaquille O'Neal, Gary Payton, Devean George, Slava Medvedenko and lone holdover Kobe Bryant. 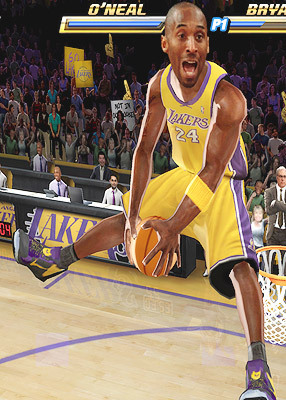 This close-up shot gives you a good glimpse of how Kobe Bryant's NBA Jam likeness -- with Kobe's actual face perched atop his digitized body -- will look in the new version of the game. Did you spot Phil Jackson in the background? Marc Stein joins Jeff Rickard on ESPN Radio's AllNight to delve into the challenges Michael Jordan faces as the new majority owner of the Charlotte Bobcats and the ongoing difference in depth between the East and West. I know, I know. The previous Weekend Dime proclaimed the college basketball season to be over as far as those of us residing at Stein Line HQ are concerned. That doesn't mean we're oblivious to how much March Madness means to the outside world.